Begin by speaking to Fred, located in his house northwest of Lumbridge Castle. Tip: To save time, make sure you have at least 20 inventory spaces open for the Wool you need, and an extra space if you plan to shear the sheep yourself. To start the quest you must speak to Fred on his Farm just northwest of Lumbridge Castle. Tell him you will accept his quest, and he will ask for 20 balls of wool. You can sheer the sheep yourself. Buy the wool from the Grand Exchange. Buy the wool directly from other players. For this method, you will need a pair of sheers. If you don't have a pair, there is a pair in Fred's farmhouse on the table which you can take. 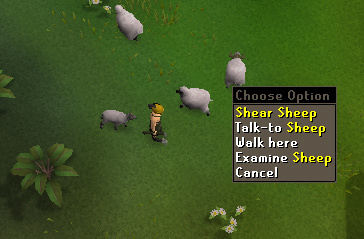 After getting the shears, you can enter the sheep pen to the east (any sheep from around RuneScape will do) right click on a sheep and choose the "shear" option to shear the sheep and obtain some Wool. Do this 20 times to 20 different sheep and you will have 20 pieces of Wool. If while you are shearing a sheep it runs away, just press the shear option again and it will be sheared. After you have the 20 wool head south-east to Lumbridge castle and go to the second floor. There you will see a ( ) icon on your in-game minimap. Make your way to the symbol on your mini-map, and then use a piece of Wool on the spinning wheel to display a window with options. 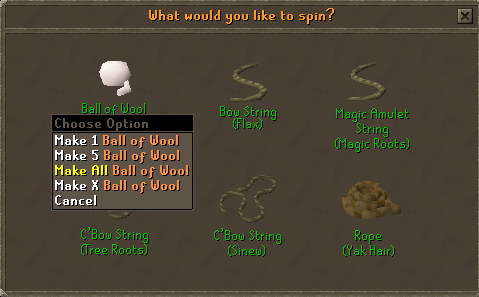 Right click on the Ball of Wool on the screen and select the "Make All Ball of Wool" option to spin all of your Wool into balls of wool. 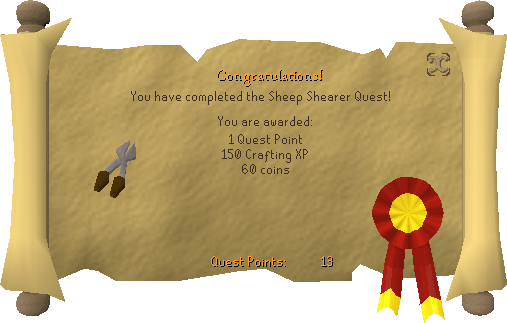 Once you have 20 balls of wool, you can continue to the Completing the Quest section below. Go to the Grand Exchange in Varrock and buy 20 balls of wool. Currently, balls of wool sell for about 10gp each on the Grand Exchange, so you can expect to pay around 200gp to buy 20 of them. This is probably the quickest way to complete this quest, as long as you have the money to spend. This method also costs money, and requires you to trade another player for balls of wool. For this reason, you should expect to pay much more than the Grand Exchange method above: up to 10,000gp for 20 balls of wool. Outside Lumbridge Castle - this location is nearby, but it may be difficult finding a seller here. Either of the Varrock banks - this is the most used location. 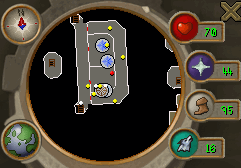 The eastern Falador bank - World 103 usually has lots of people, but it may be difficult finding a seller in this area. Now just head to one of these locations and say "Buying 20 balls of wool for 1k". Wait a short time for someone to trade with you (if you don't get a trade request, repeat), and if someone wants more money (no more than 10,000gp) for 20 balls of wool, accept their trade. Bring the 20 balls of wool to Fred to complete the quest! 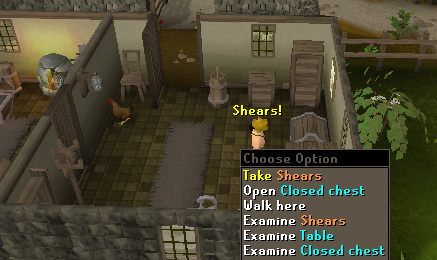 [^] Use shears on 20 Sheep to get 20 pieces of wool. [^] Buy 20 balls of wool from the Grand Exchange. [^] Trade a player for 20 balls of wool. [^] Bring the 20 balls of wool back to Farmer Fred.